Mirror Snake is an Oakland, CA-based neo-psych band. They play hard-edged post punk fuzzed out psychedelic rock that brings to mind bands like Dead Flowers, Plastic Crimewave Sound, and at times Amon Düül II. Mirror Snake is Rebecca (vocals), Chris (vocals, drums, guitar, bass, flute, percussion), Clint (guitar), Danny (guitar and percussion), Joe (bass and percussion), and Nancy (spoken vocals). Their debut self-titled CD contains 12 high-energy songs packed into a mere 33 minutes, which is far too short. Peppered throughout are some very cool guitar solos by Danny and Clint. Stitching the songs together are several short instrumentals that are so well executed you don't realize how rapidly time is passing, the sonic equivalent of a time warp. You blink and the CD is over. 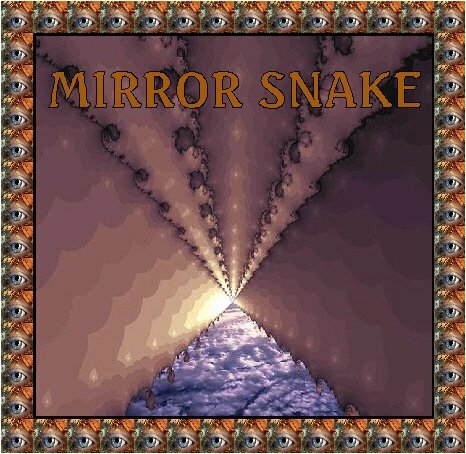 All in all, Mirror Snake is quite an impressive debut for this young band. I only wish that they had packed more music into this release.